Jhanga (Ajit) is a cruel, brutal, and heartless dacait, who has terrorized the entire countryside. The police are unable to capture him, as he has several hideouts and nearby villagers are afraid to give out any informaiton, fearing the reprisal of his wrath. 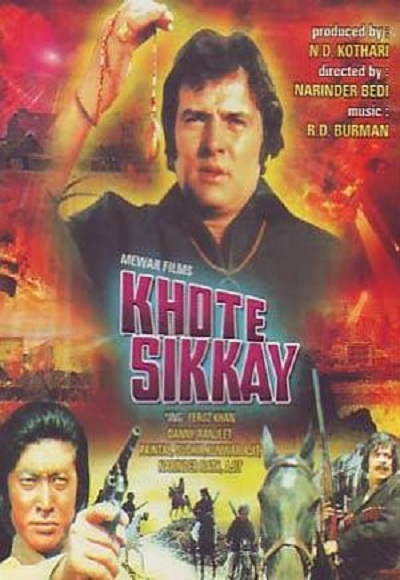 A black cloaked horseback rider (Feroz Khan) is looking for Jhanga, to avenge the death of his dad, a judge (Satyen Kappu) who had convicted and sentenced Jhanga, however, whenever he comes close, Jhanga manages to escape. Then five men, all petty criminals, come to claim the reward for handing over Jhanga to the police. These five men do not trust the horseback rider, and will not have anything to do with him. While these men waste time who gets to Jhanga first, Jhanga is safe in his hideout, planning more attacks on the hapless community. Will Jhanga ever be apprehended? Since being introduced by a friend to the stunning Bollywood Western Sholay,I have always wondered if there were any other Dacait "Curry Westerns" that have been left in the shadow of the landmark film.Deciding to at last search round to see if I could find any hidden gems.Doing a detailed search on Ebay,I was absolutely thrilled to eventually find this good looking "Curry Western" staring right back at me,and also being sold at an unexpectedly cheap price.